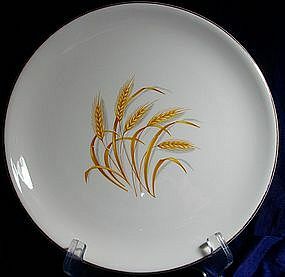 Scio "Hazel" Dinnerware, a popular pattern in the mid century. These pieces are getting harder to find in nice condition. 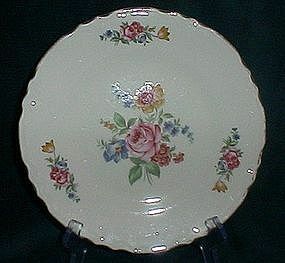 I have available 2 dinner plates, 2 saucers, 1 coupe bowl 6", 1 11 7/8 serving plate and 1 9 7/8" serving plate, 1 coffee cup. Each of these pieces have some imperfections. If interested, e-mail for complete description/additional pictures. Prices can be negotiated from there. 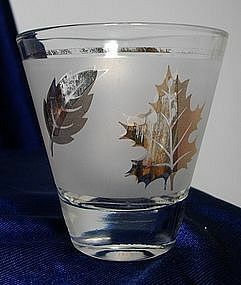 Libbey Gold Leaf or Gold Foliage double shot glass, shows some gold wear. 2 3/4" tall. $1.49 plus shipping. 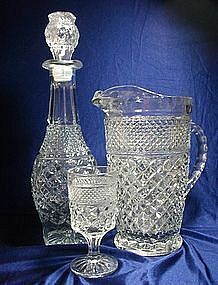 3-3 3/8" old fashioned glasses, nice condition, $2.99 each plus shipping. 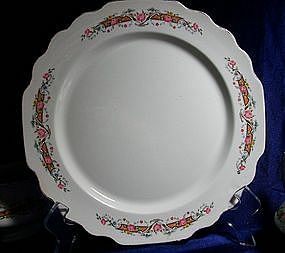 5 9 1/4" luncheon plates, one saucer, and a gravy boat are available in this Homer Laughlin Dogwood pattern, Liberty shape. All in nice condition. Luncheon plates $9.99 each, gravy boat $32.99. Saucer $3.49. Offers welcome. 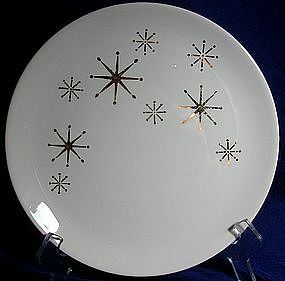 Royal USA Snowflake Dinnerware. 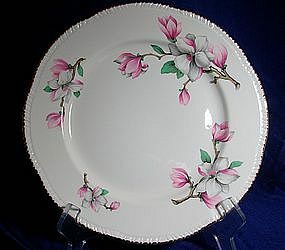 I have 8 9 1/4" plates, 1 saucer, 17 6" dessert plates. 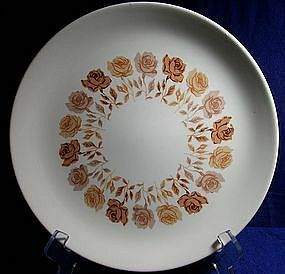 I also have 1 6" saucer in this pattern but is mustard gold rather than shiny gold. Most of these pieces are in good condition, however due to age there are some flaws you should know about before buying, please e-mail for full description and prices. 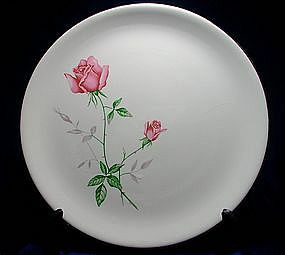 Taylor Smith & Taylor Ever Yours Shape Boutonniere Dinnerware. Nice condition. 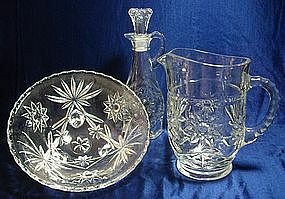 I have the following pieces available 5 dinner plates 1 13 1/2" serving platter 3 dessert plates 1 small bowl 1 8 1/4" round vegetable bowl 1 cup 1 glass tumbler Please e-mail for complete description and pricing. Willing to negotiate! 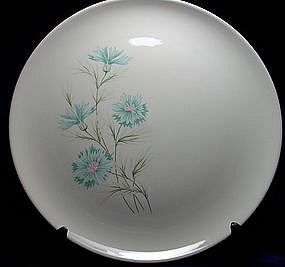 From W. S. George in the Lido shape is a pattern called Flower Rim. Decorated with pink roses and grey scrolls on a burnt orange band. 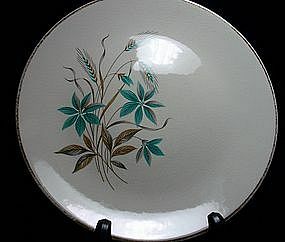 I have 5 plates and 5 saucers, they all show some wear, A 1 11 5/8" serving platter, VGC, Creamer and Sugar Bowl VGC. Please e-mail for price negotiation and condition. 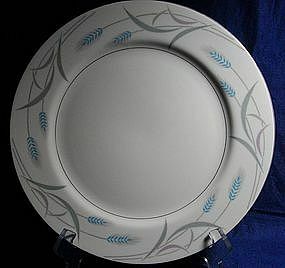 From Steubenville Pottery is the Fairlane pattern dinnerware. 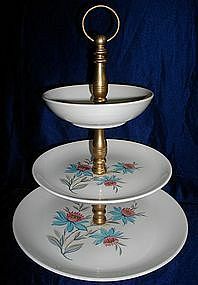 I have 6 cups and the 3-tier tidbit server available. The stand for the tidbit has been repainted but otherwise all in VGC. Asking $2.99 each for the cups, $14.99 for the server. E-mail for additional info or to make an offer! 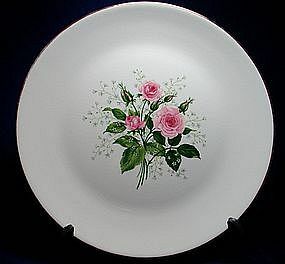 Homer Laughlin Pink Rose 3656 Dinnerware Pattern. 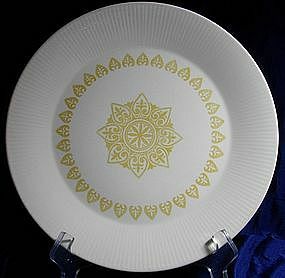 2 dinner plates 2 salad plates 1 saucer 4 small bowls 1 cup These pieces do show some wear, a couple pieces have very small rim chips, please e-mail for complete description and pricing. Willing to bargain!